This photo doesn't show well enough how awful these ceiling tiles looked in person, they sagged in spots and had chipped edges that showed cardboard brown through them. We were unhappy with the old ceiling. 14 years ago - in our beginner DIY days - we put up the only easy, affordable ceiling we could think of: cardboard, acoustic ceiling tiles. Now, ceiling tiles are a great, budget option and they served us well for years. But they have their challenges. If one gets damaged - which is what happened to us a bunch of times - it's really tough to replace it. Each one slides into the one before it and is stapled. Easy install the first time = nearly impossible to fix. And, they aren't much to look at. In a strange role reversal, this ceiling tile issue bothered Ed more than me. They drove him around the bend, while I was merely indifferent. This almost never happens! 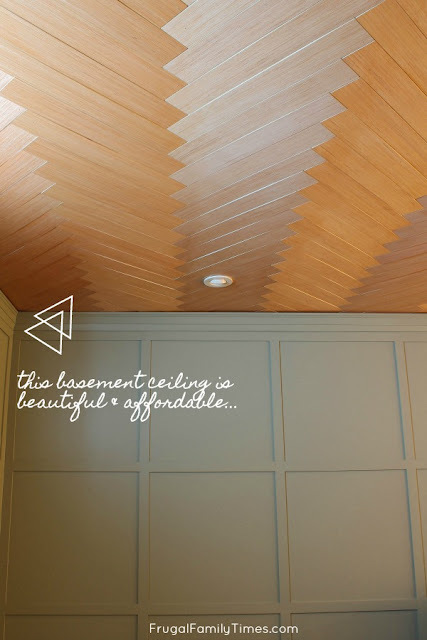 We priced out a few available options - including some new products geared towards basement ceilings. We had seriously entertained a product that would have cost us about $1000 for this approximately 100 square foot room. And the more we researched it, the more we leaned away from it. My big hang up was that it couldn't be painted. I don't like limits, especially when it comes to colour. I LOVE colour and this product would seriously cramp my style. So we resorted to our old standby for idea generation: wandering through the aisles Home Depot and hoping a solution jumps at us. It worked! Eurkea! 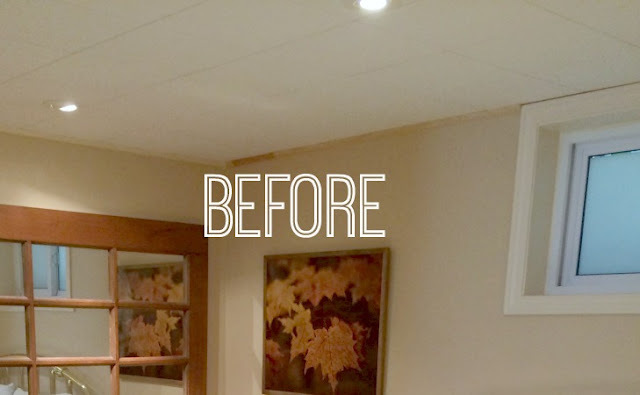 We found a great product that let us make our basement ceiling idea on a budget - and a wood panelled one at that! It wasn't that hard and it turned out really well. 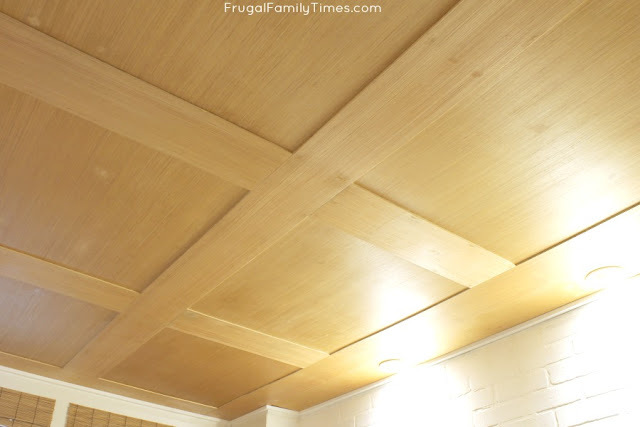 It sure doesn't look like a plywood ceiling! This ceiling! I adore how it turned out and I can't believe how little it cost. Less than $150 for the whole room! Whaa!??! Yes! We loved how uniform the surface was - it's very smooth and the colour was the same board to board. The striations reminded me of bamboo, while still being subtle and interesting. 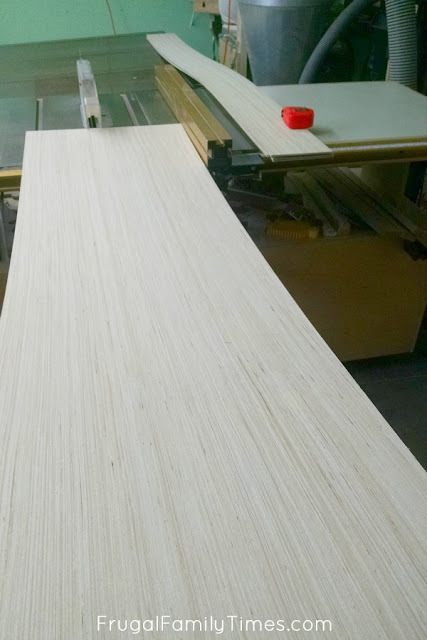 It was much later we learned that RevolutionPly plywood is also from sustainable wood sources. 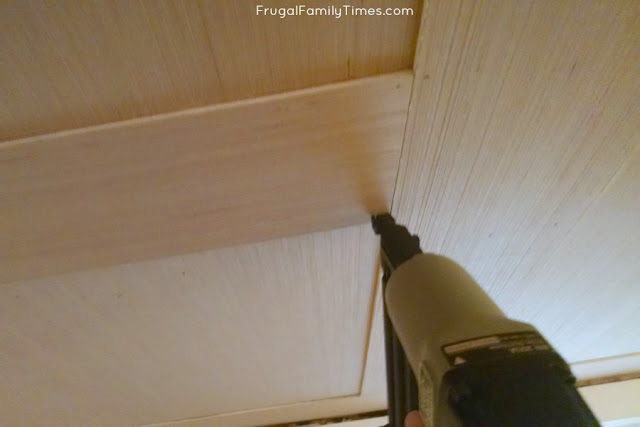 I now want to put this plywood in all the places!!! Step 1 - Strip down to the joists and make a plan. 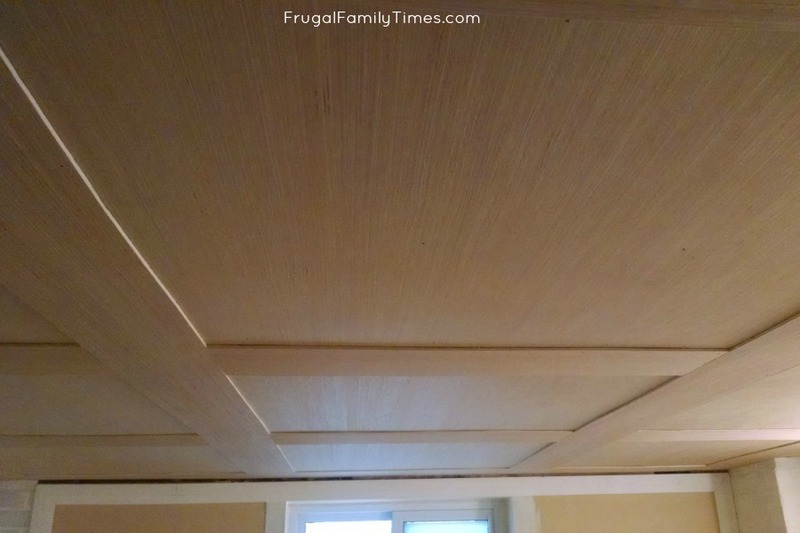 Our old ceiling was acoustic tile - which meant nailing (or in our case - staple) strips ran perpendicular to our floor joists. We tore all of that down and cleaned up any stray nails and got a clear view of what we were working with. 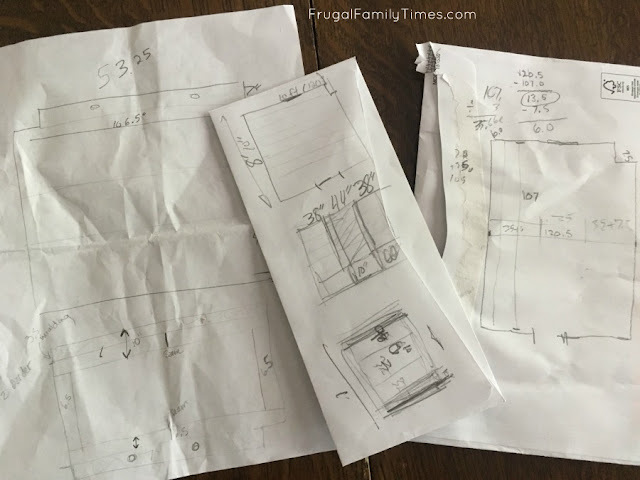 You'll want to measure and plan out how to cut your RevolutionPly sheets in order to make the seams where you want them (ie: evenly across the room). We took a while debating this. Every room is different, you should probably do the same. This is actually the hard/time-consuming part and once you have a plan, the rest goes pretty quickly. Yes, these really are all the various drafts we went through in planning the ceiling seams. See how frugal? We use envelope backs! When you know where the seams are going to land between the big sheets, add some 2x4 blocking sections between the joists. This gives you something to nail into on all borders of the big sheets. Step 2 - Put up the big sheets: begin with all of the hard cuts first. 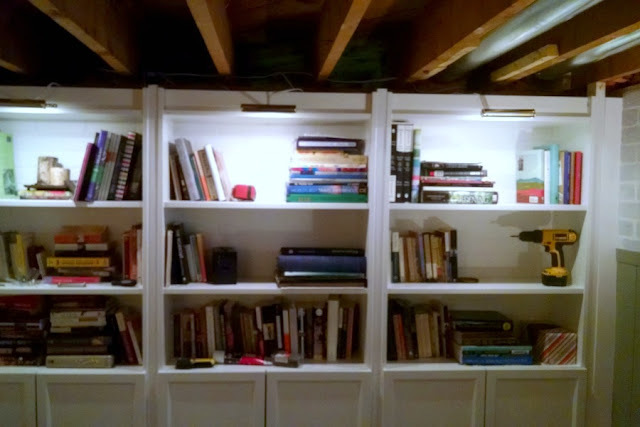 We had a couple of pot lights we wanted to reuse to accent our faux bricks wall - and for - you know, light. 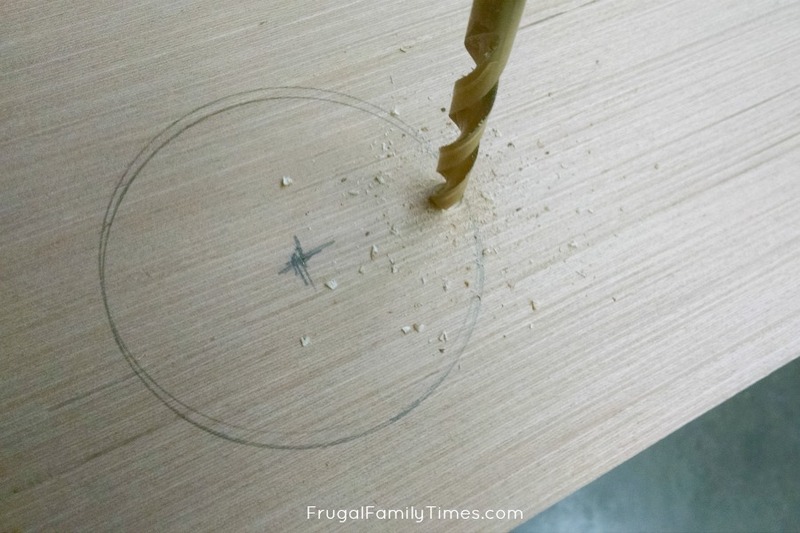 We planned their locations and drilled and jigsawed holes for them in our first sheet. Ok - now come the apologies...we have no photos of us putting up the big sheets. It took two adults and two teenagers (our daughter and her friend) and between holding and nail-gunning we forgot to take a photo. Suffice to say, we put up three 8'x (approx) 40" sheets, nailing them to the joists and blocking that we put up for the seams. Step 3 - Measure and rip strips for the raised sections. This was a balance between minimizing waste and making them a width that was both attractive and functional (meaning, it covered all the seams on the large sheets). We settled on 6.5" and ripped our remaining sheets longways into a bunch of raised panel strips. 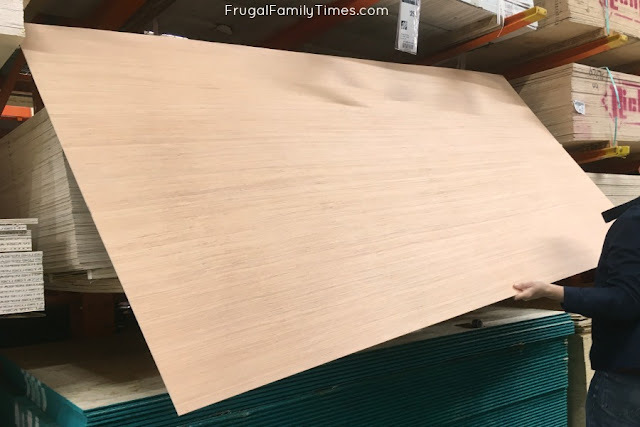 - the plywood is long and floppy. Step 4 - Glue and Nail them up! This is where things get exciting. We covered the long seams between the large sheets first and then cut smaller pieces of the raised panel strips to do cross sections. Use construction adhesive and nails - we learned our lesson from the vertical shiplap. 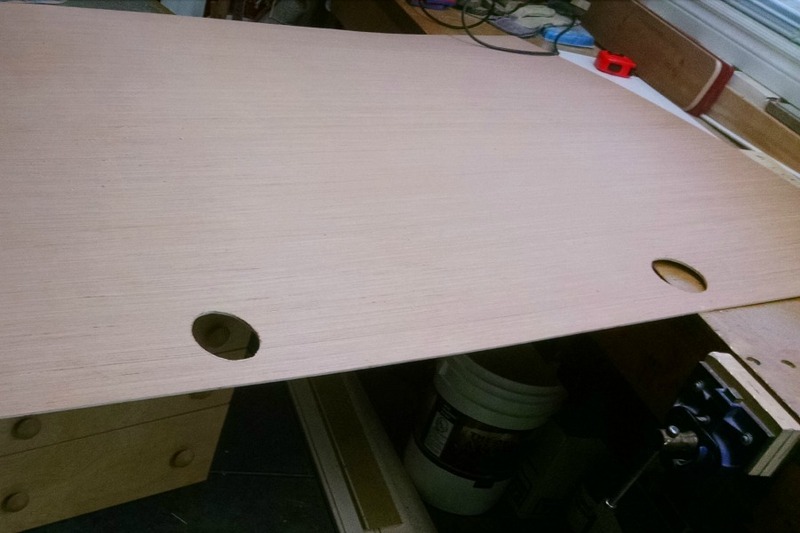 Be careful with the adhesive, both when applying it on the worktable/bed 😜 and when putting the panel up. Don't get it on anything you want to finish natural wood colour or it won't look natural anymore. Nail in place - use enough nails to hold up the panels, but no more than you need (Very descriptive, I know - basically only put enough nails in any given sheet to prevent sagging. Our big mistake was using too many nails, having to fill many holes and sand. We screwed up the fill and made spots on the ceiling that didn't take the finish evenly. Step 5 - Finish and trim out. We used our old favourite - Tung Oil. It took three coats with a light, 220- grit sanding before the final one. We then trimmed out bookcases with crown mould and used some simple square stock everywhere else. - and what you can do to NOT make it too. If you look at the next two photos, you can see the bane of my existence. I tried filling the tiny, really insignificant brad nail holes with "cabinetmakers putty" (wood glue and sawdust). I was not skilled in its application, nor fully versed in how it would affect the finish we wanted to apply. Always do a test piece! Normally, that's exactly what we do. This time - we jumped in head first. WHY?!?!? So many regrets. Some of the things that should jump out at you are the light brown spots where the fill/sanding was, let's say, overly enthusiastic. When we do this again, we are not going to fill the holes at all until after we finish and even then, only if it actually shows up as an eyesore. We also plan on using colour matched finishing fill sticks (only if needed) instead of sawdust/glue mess. 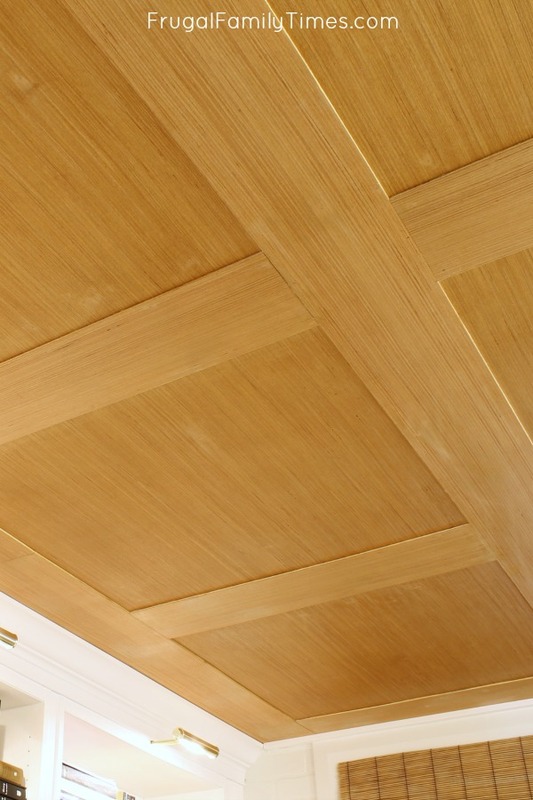 Such a beautiful ceiling - we're sad about those darn spots - but your ceiling will look even better with our tips! 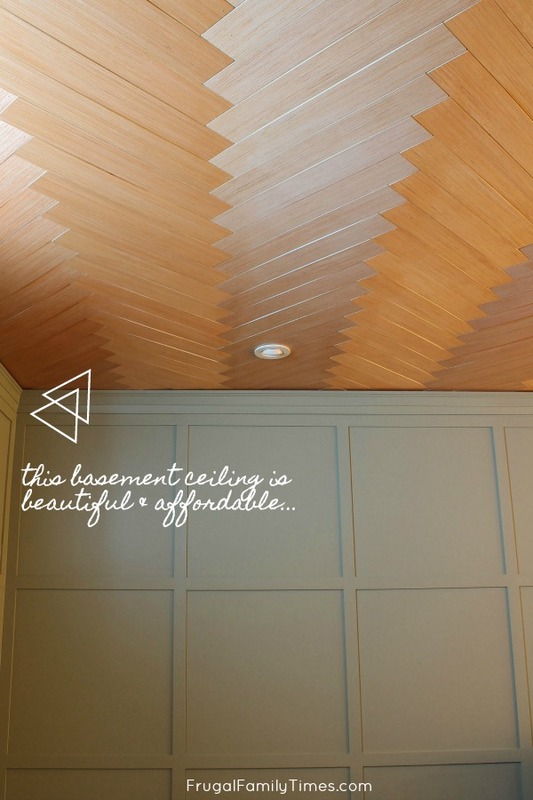 we used the same material in our adjoining media room - a herringbone ceiling! It's so beautiful - I hope you love it too! less than 150$ for whole room!! Ah Ah Marvelous!! Great Post! Looks fabulous! 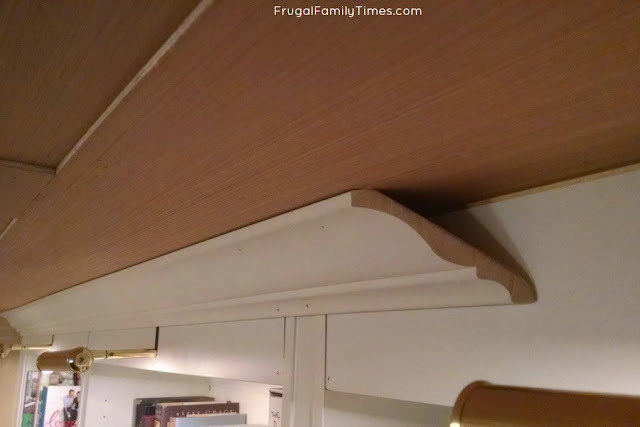 I want to hide my popcorn ceilings, but this is way beyond my skill level! 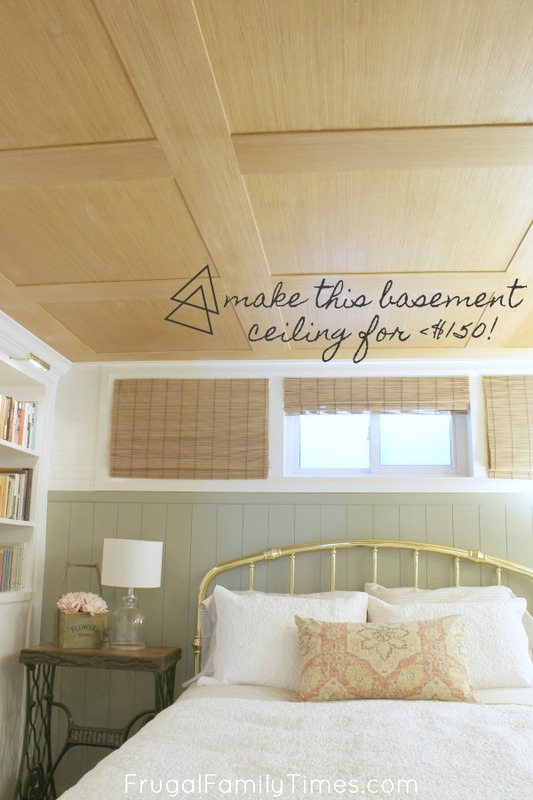 We’ve got a ceiling treatment coming up later this month that you may find easier, Debbie! That looks absolutely fabulous! So incredibly pretty and love the color esp for a basement. Still nice and light. 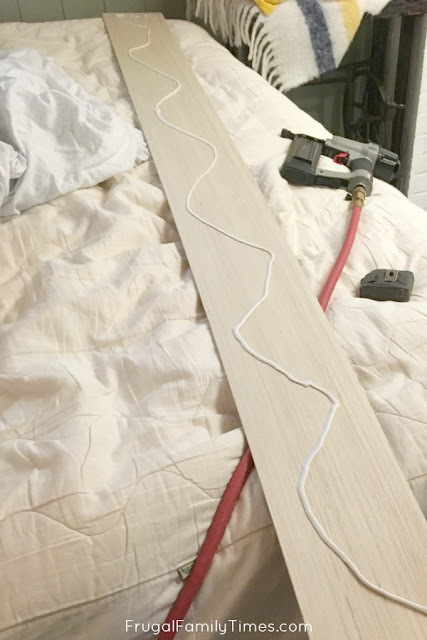 Were any of your raised panel strips longer than the 8' length of the board? Were you simply able to match them up? Yes, the room was both slightly wider and longer than 8 feet. We choose to put a strip of panelling around the edge to help make the interior sections manageable. To make the edge strip work, we did have to create a couple seams. You can see one of them on the left hand side of the photo under the "Here's what happened..." section midway up. It will be inevitable when working in rooms bigger than 8'x8', so pick inconspicuous locations where possible. Would you recommend this in a bathroom?